On Saturday, a package arrived from Amazon. There were a few items in it that I knew of (some crafting supplies), but B was very secretive of one of them. 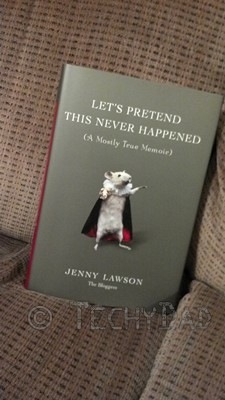 She told the boys to give me my early Father’s Day present: Let’s Pretend This Never Happened (A Mostly True Memoir) by Jenny Lawson aka The Bloggess. So this is not a full book review. Instead, consider it a book pre-review. I’ve read enough to form an initial opinion. And that opinion is: I’m hooked. You might know that I’ve been through some stressful times recently. I’ve come to rely on video games for stress relief. Jenny’s book has now been added to my stress relief quiver. Nothing cures stress like laughing and a few minutes with Jenny’s book had me giggling like Anderson Cooper. Normally, I don’t giggle as high-pitched as Anderson does, but Jenny’s hilarious stories totally triggered fits of giggles in me. After a mere five minutes of reading, I felt my stress melt away and I began joking with everyone. I felt in a better mood than I had felt in some time. Jenny’s book is filled with funny stories of her experiences growing up. Experiences that made my own life look downright boring. From what I’ve read of it, I’d definitely recommend Let’s Pretend This Never Happened (A Mostly True Memoir) by Jenny Lawson.